Custom group header cells with column totals? I have the data in my grid separated out into groups. I see that from https://help.syncfusion.com/xamarin-ios/sfdatagrid/summary I can do some customization of the group header cells to include some descriptions and calculations from the data in that group. number, could I created 2 buttons before my totaled columns? You can customize the caption summary row by setting the SfDataGrid.CaptionSummaryRow property. Refer the below code snippet to write a custom aggregate to calculate the summary values based on custom logic for GridSummaryColumn.CustomAggregate property. We have also prepared a sample based on this and you can download the same from the below location. Awesome that helps immensely. Two more questions to see if it is possible. Can I have a label that spans both the Codes and Desc columns? Can I add UIButtons after this label? We have checked your query to customize the grouping header. Currently we do not have support for custom template in grouping row, however we have already considered this requirement as a feature and planned to implement it in any of our upcoming releases. Please check our website periodically to get the list of features that are implemented. Since I cannot create a custom template for the grouping header, is it possible for a group to have both a row with GroupCaptionTextFormat and a row with my custom GridSummaryRow which contains the calculations? I have implemented my grid both ways. With the GroupCaptionTextFormat, I am able to hide the column that I am grouping by and then display the relative text which spans 2-3 columns. With the GridSummaryRow, I can do the calculations, but I haven't been able to find a way to display the data from the grouping column in that row properly. We have checked your query. Currently, it is not possible to show both the caption rows(row with CaptionSummaryRowText) and group summary rows(rows with summary calculation of particular group) in SfDataGrid. However, we have already logged a feature report for GroupSummary support in SfDataGrid and the same will be available from any of our upcoming releases. Since the feature is tentative, we can’t able to provide the exact timeline for the reported feature. Please check our website periodically to get the list of implemented features. If your requirement is different from what we understand, then please do revert us with some more detailed information regarding your query. There are basically 3 parts that I need for this functionality. So far, I have been able to get 2 of them to work separately, but not together. Also, I need to be able to calculate totals for certain (or all) number columns in that group and have the calculated value appear under the correct column. Finally, I need some way to display buttons in the header row as well. If nothing else, a single button would work. I don't believe there is any way to do this currently, but something like this is what I would like to be able to do. You can group and hide that column using GridColumn.IsHidden property. You can achieve this by using SfDataGrid.CaptionSummaryRow property. 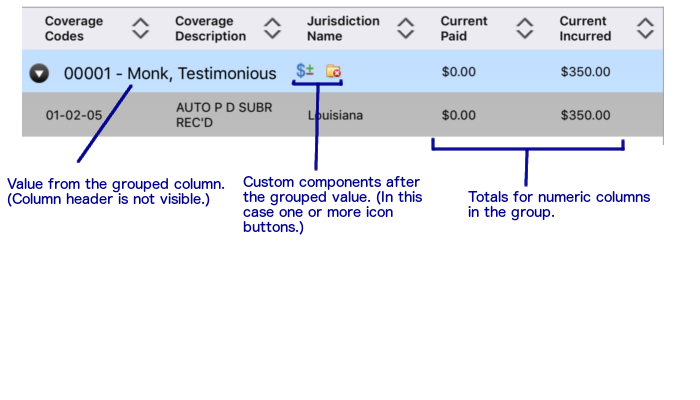 Using GridCaptionSummaryRow you can show summary information in the column by setting GridSummaryRow.ShowSummaryInRow to false and defining summary columns. Currently we don’t have support for this. However we have plans to support GroupTemplate in any of our upcoming release.